Here are expanded notes and new research on the films presented on November 18. Inaugurating a new annual collaboration between the Museum of Modern Art’s To Save and Project Festival of Film Preservation and the Orphan Film Symposium at NYU. → Two pieces from the man who founded the Amateur Cinema League in 1926, plus the premiere of the 2K scan of a day-in-the-life film by an ACL enthusiast from Montclair, New Jersey. Geer wrote about the making of his poem in Movie Makers magazine. → Before the Polyvision triple-screen in Napoléon vu par Abel Gance (1927), unidentified filmmakers made this widescreen experiment. Based on the poem by Thomas Bailey Aldrich, first published as "Voices and Visions" (1893), and subsequently as “In Youth, Beside the Lonely Sea” (1896 and thereafter). → A founder of the Toronto Amateur Film Club earned one of his three Ten Best awards from the ACL’s Movie Makers magazine for this city sinfonietta. Thanks to Josephine Black (Toronto Film and Video Club); Archives of Ontario; John Gledhill at Bit Works, Inc.; and Peter Oleksik (MoMA). DCP premiere. → Premiere of new 16mm print. Preserved by NYU Libraries (Nancy Cricco, Janet Bunde, and Paula De Stefano) with a National Film Preservation Foundation grant. Thanks to the Barstow family. Author: Vladimir Medvedev, People’s Film Studio of the House of Culture of Professional Technical Schools of Leningrad (DK Proftekhobrazovania). Script by Boris Goller. → A Soviet dance ensemble boards the ship Mikhail Kalinin in Leningrad and travels to Montreal, at the time when traveling abroad was akin to flying to the moon. Digital copy from the director’s 35mm print. Above is the text handed out to the audience at the MoMA screening on November 18. Below is a multimedia elaboration of it. Four alumni of NYU’s Moving Image Archiving and Preservation master's program hatched this idea. Walter Forsberg (now at the Smithsonian National Museum of African American History and Culture), Kathleen Maguire (The Exploratorium), Jonah Volk (NYPL), and Kim Tarr wanted to gather previously unknown amateur films, works of aesthetic distinction, and curate a DVD or website. That reactivated my desire to track down the many missing works on the filmography of the Amateur Cinema League’s annual Ten Best list. You can find the complete filmography here: Alan D. Kattelle, “The Amateur Cinema League and Its Films,” Film History 15.2 (2003): 238-51. The list extends the ACL's Ten Best (1930-54) to include the American International Film [& Video] Festival's continuation of the awards through 1994. NYU students Dan Erdman and Kathryn Gronsbell added to the research in 2013. Marissa Hicks-Alcaraz worked on this MoMA program over the last several months. Movie Makers (Nov. 1930), 716. Others have been searching too, including the founders of the Center for Home Movies (Katie Trainor, among them) and most recently and actively Charles Tepperman. He has organized the workshop "Mapping an Alternative Film History: Towards an Amateur Movie Database" for the 2015 Society of Cinema and Media Studies conference in Montreal, with Karan Sheldon (NHF), Nancy Watrous (Chicago Film Archives), Dwight Swanson (Center for Home Movies), and myself (Dan Streible, NYU) participating. Finding small-gauge film prints these days means getting them copied into a viewable format. Ideally, preserved on film stock, but more realistically, scanned or transferred to digital video. Thanks to the community of archives, libraries, scholars, collectors, artists, and lab experts who constitute the orphan film movement, we are getting high-resolution digital access copies of these rarities. Preservation and access work for these films was done by Colorlab (film-to-film preservation and 16mm print of The Abbakadabba Coopno), the Library of Congress (35mm film preservation and print, plus HD backup of [Triptych Poem]), Bit Works of Toronto (HD digitization of 16mm print of Another Day), MoMA (Peter Oleksik made a DCP of Another Day for this program), and Net-Film of Moscow (HD digitization of 35mm print of On the Same Earth). Northeast Historic Film did in-house 2k scanning of Poem of Montclair. As the keeper of the Toronto Film and Video Club collection, the Archives of Ontario will be the repository for Another Day. 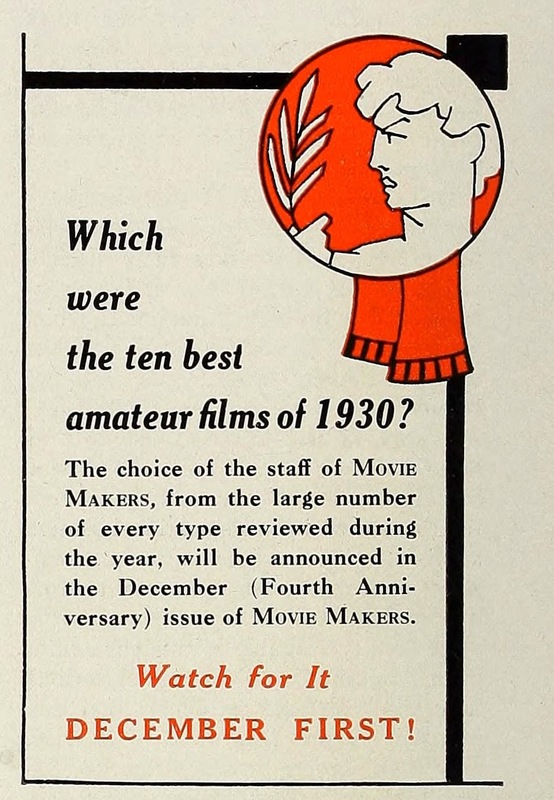 Movie Makers (Nov. 1930), 724. Curator Josh Siegel invited Katie Trainor and me to organize an orphan film / amateur film screening as part of the 12th To Save and Project: The MoMA International Festival of Film Preservation. And he was generous in announcing this as an annual collaboration with the Orphan Film Symposium. Since home movies and amateur films have always been a core part of the symposium, it was a good match. 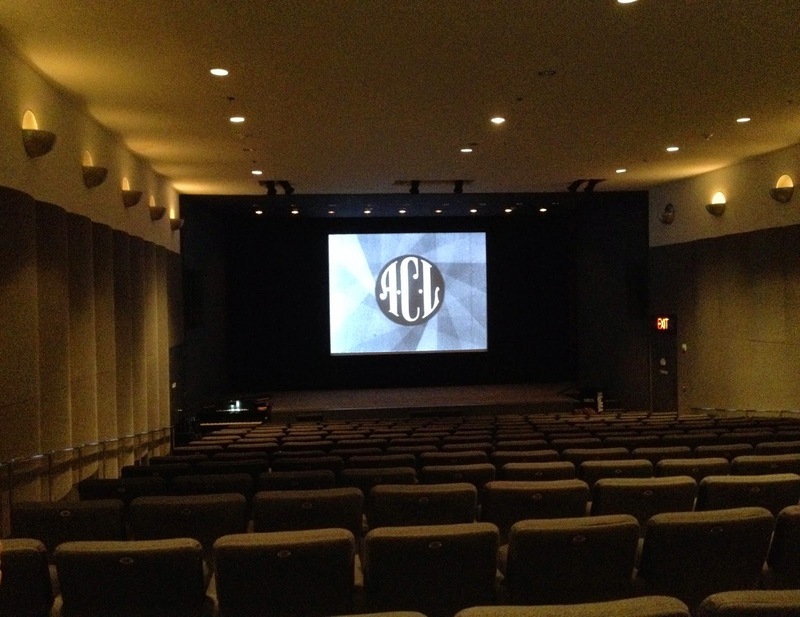 Playing in the theater before showtime was a looping slide and video projection, with samples of some Amateur Cinema League animated leaders, plus images and text about the ACL, Movie Makers magazine, and our filmmakers. Here's one of the ACL animated logos (ca. 1931), as posted by the Center for Home Movies, in a state of decomposition. Above: As found in the home movie collection of James A. Mahoney Jr. Above: Joe Gardner at NHF scanned the 16mm print of Poem of Montclair. It begins with these two ACL leaders joined together. This ACL leader design appears in the home movies of Gertrude and Philip Medicus. Taken from Little Journeys to Niagara Falls and Canada, August 1931, Prelinger Archives, archive.org. Nearly as soon as the ACL incorporated, it sold "leaders." An ad in October 1929 Movie Makers reads: "SPLICE IN . . . The finishing touch to an attractive reel is added by one of these fourteen foot animated Amateur Cinema League Leaders. They are so designed that they can be divided and one half used for the leader and the second half for a trailer" (672). They sold for a dollar (14 feet of 16mm film); three dollars for 35 feet of 35mm film. 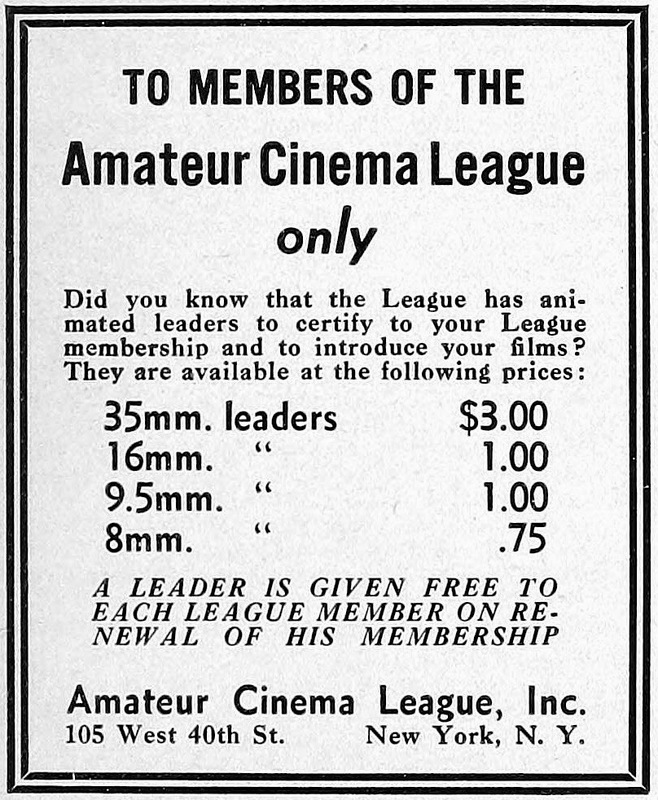 By the early 1930s, the League was selling 9.5 and 8mm versions. Movie Makers (May 1933), 215. In April 1936, Movie Makers celebrated an advanced edition of the ACL's "cinematic badge of membership." "The new League leader is full of modern cine tricks different from those that have been used before. It contains iris wipeoffs, beautiful effects produced on an optical printer, 'zoom' shots, animation, double exposure and many other tricks." We can hope that a copy of this whiz-bang version is rediscovered! David Weiss, co-founder and executive director of Northeast Historic Film in Bucksport, Maine, introduced two pieces from the Hiram Percy Maxim Collection, which includes more than 25,000 feet of 16mm film (with more on the way). Scarf Dance (Hiram Percy Maxim, 1930) silent, b/w, 16mm, 2'. This web video samples other amateur pieces not on the MoMA program, such as a minute from Boothbay Harbor (O. P. Geer, 1938) silent, color, 16mm. The assigned title Up the Moose River in 1928 is taken from an intertitle that appears in reel #21 of the Maxim home movie collection. Some five minutes of the 350 feet of film were screened from the silent, black-and-white 16mm print (accompanied by Stephen Horne). The scenes depict a trip to and activities at a camp on an island in Moosehead Lake, Maine. Maxim and his daughter are seen with Henry Holden. The subsequent intertitles read "At the Head of Attean Lake Is the First Carry," "Henry Holden Guided us in 1928," "Holeb Falls Cabin where we lived for a week," "Our garbage disposal system" (she throws food scraps into the woods), and "A long trip up stream without guide." Olin Potter Geer ("a lawyer by day and film editor at night," he says of himself in an intertitle) wrote about the making of Poem of Montclair in “Suburban Scenario,” Movie Makers (September 1933). The O. P. Geer home movies come from NHF's Blanche Geer, PhD Collection, named for the filmmaker's daughter. 7,000 feet of silent, black-and-white 16mm reversal film on 22 reels, shot from 1930 to 1945. The archive scanned the 4 reels that made up Poem of Montclair to make this re-premiere screening possible. It's likely that the movie had not been seen in some 75 years. 'Life in a commuter's family from day to midnight.' Horse and buggy approaching. Milk truck, paperboy, man shaving. Percolating coffee, woman cooking eggs. Man reading morning paper, chauffeur to school. Police officer controlling traffic. New York ferries, skyline. Bank teller through bars, market. Grocer brings bag to Geer's car. 'The hours spent in New York are another story, so back to Montclair.' Armory Horse Show. 'The Night Before Christmas' 1932. Stocking, tree, presents. Family dinner, African American household servant. Winter exterior shots. Outdoor, dog, various activities. '2 p.m. Saturday at the Montclair Club.' golf. 'Radio celebrities I have interviewed' with radio. Woman typing. Two couples playing bridge. Drinks. Geer operates splicer. Sets up projector. That reflexive moment at the end is just one of the playful cinematic touches. Throughout the narrative Geer uses the kinds of camera tricks amateur enthusiasts often brought to their work, particularly slow motion and reverse motion sequences. His opening and closing titles were made by filming the letters, made of wax, melting. Stephen Horne accompanied the screening on piano and accordion. The elegantly designed Movie Makers cover. O. P. Geer splicing (frame from Poem of Montclair). Accompanied live by Stephen Horne, with an improvised score using piano and flute. The brackets around the title [Triptych Poem] are important to keep in mind. They remind us that it is simply a descriptive title assigned by a cataloger at the Library of Congress, circa 2001. Initially LOC also cataloged it as Unidentified Academy No. 01. The film print bears no on-screen title and there is no known reference to the movie's existence until it showed up in the collection of miscellaneous nitrate prints that Earl Theisen donated to the Academy of Motion Picture Arts and Sciences. This YouTube version was uploaded in 2010 by GoldenSilents (who seems to be associated with Larry Smith, aka larry41onebay, who works with nitrate film at the Library of Congress). This is in fact the version created for the Unseen Cinema DVD in 2005. It includes an added piano soundtrack (music of Edvard Grieg, "Norwegian Dances"  and "Lyric Pieces"), an epigraph from Kevin Brownlow, a new assigned title In Youth, Beside the Lonely Sea, and credits dating the film as ca. 1924-25. Larry Smith's YouTube annotation documents the eureka moment at the LOC Motion Picture Conservation Center in Dayton, Ohio. I remember the day this forgotten film was discovered. I had just started volunteering at the Library of Congress nitrate film vaults in 1998. I had friends who worked there and they knew of my passion for Cinerama since I had managed the Neon Movies [independent film theater in Dayton] and assisted John Harvey on installing his equipment and prints to show true 3-projector/3-camera Cinerama. It was Vanessa O’Kelly who was processing the unidentified reels of the Theisen collection when she noticed this film had 3 panels. The date 1924-25 is used in the booklet for the 7-DVD set Unseen Cinema: Early American Avant-Garde Film, 1894-1941, curated by Bruce Posner and produced by David Shepard for Anthology Film Archives in 2005. On disc one, "The Mechanized Eye: Experiments in Technique and Form," it appears amid 17 other short films as In Youth, Beside the Lonely Sea, programmed between another work by an unknown maker, Melody on Parade (ca. 1936), and the 1904 actuality Westinghouse Works, Panorama View Street Car Motor Room, by the noted avant-gardist Billy Bitzer. Elsewhere in the Unseen Cinema series it is referred to as "Triptych Film Poem (c. Unidentified filmmaker, 1925)." One of the few other 35mm screenings came at the 2001 Giornate del Cinema Muto in Sacile, Italy. The festival catalog referred to [Unidentified Theisen No. 1: Triptych Poem] (1928? ), with a short note by George Willeman. Inserted in that annotation is this: "[The Italian company Ambrosio used the same technique in some of its travelogues of the early 1910s. - Eds.]" Indeed here is a snippet of a triptych from the beautiful Ambrosio scenic Santa Lucia (ca. 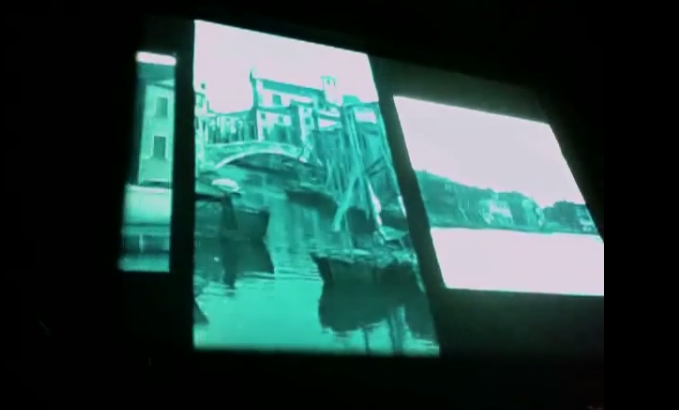 1910, preserved by EYE and Cineteca di Bologna; with piano by Donald Sosin in 2010). The triptych shot comes 2:46 into the five-minute Santa Lucia (ca. 1910). Video from Donald Sosin. I’ve no idea where the 1928 date comes from, although it is on the MAVIS record (well, actually “ca. 1928”). I pulled the nitrate to confirm some dates. The print itself is on 1926 Kodak stock, per the edge code. The print-through from the negative was hard to discern (possibly because of all the overlaying?) but I was finally able to discern that the negative was also 1926 [with some pieces of 1925 stock]. So my guess is that the film was made in 1926. I don’t think it has any connection to Gance’s Polyvision, as that was a three screen, three projector, three frames of same AR [aspect ratio] process, whereas this is more like a triptych, with full-size frame in the middle and undersized frame "wings" on either side. P.S. I am changing the date in the MAVIS record to 1926. The mistaken connection between this mysterious triptych movie and the French Polyvision system of 1927 stems from the original inventory of the Earl Theisen Collection. Here's the typewritten list. From the Library of Congress (thanks to Mike Mashon, Head of the Moving Image Section). It's not clear who added the Polyvision descriptor, much less designated it a "test" of that wholly different system. (French manufacturer André Debrie devised the triptych cameras, with synchronized motors, used to film the Napoleon sequences. Not even Gance saw the triptych effect until three projectors were set up. And that method of presentation for Napoleon was not seen in the United States until the 1980s tour. See Kevin Brownlow's 1968 book The Parade's Gone By . . . .) Given that the original print of [Triptych Poem] was found in the U.S. (and uses an American literary source in a familiar way), it's unlikely that this film was made outside of North America. Where would such a film have been seen? Its production values and sophisticated optical printing seem to make it unlikely to have been merely a test. Although there is no way to prove it was an amateur film, it has stylistic qualities similar to the experimental narratives that amateurs deluxe J. S. Watson Jr. and Melville Webber produced in the late 1920s and early 30s. They earned some of the earliest ACL Ten Best awards with The Eyes of Science (1931) and Lot In Sodom (1932), for which Watson did extensive effects on a "homemade" optical printer he built with Carl Louis Gregory. So far there's no evidence of [Triptych Poem] showing up on the amateur film circuit. The only lead thus far is (as Bruce Posner conveyed in an e-mail) that Kevin Brownlow recalled seeing a 1920s film of similar description in the 1960s. But where? 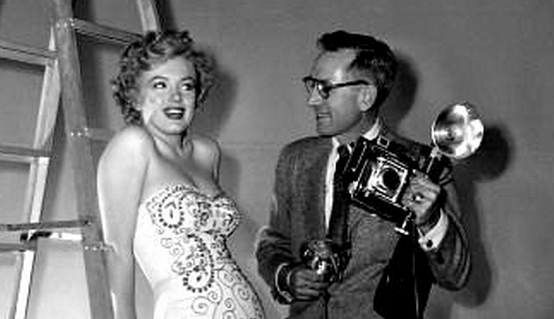 Theisen with Marilyn on a set, Los Angeles, 1952. His success as a popular photographer extended from his credits for Joan Bennett's book How to Be Attractive (Knopf, 1943) to his own books marketed to the amateur, Making Your Pictures Interesting (Ziff-Davis Publishing, 1947) and Photographic Approach to People (Amphoto, 1966). The Look Magazine Photograph Collection at the Library of Congress includes a couple dozen images by Theisen, including shots of Audrey Hepburn, Salvador Dalí, Hal Wallis, Walter Wanger, Walt Disney, the cast of Mary Poppins (1963), and . . . wait for it . . . L. Ron Hubbard in 1950. In 1939, Look published Theisen images in "America's Own Refugees: The Story behind 'The Grapes of Wrath'" (Oct. 24). He was in fact one of the founding photographers for Look, which launched in 1937. Earl Theisen (1903-1973) was born in Denver and educated in Chicago and Los Angeles. He entered the film industry in 1922 when he took a job with the Alexander Film Company. He left Alexander for Consolidated Film Company. In 1931 he began researching early cinema history and collecting artifacts under the auspices of the Los Angeles Museum [now the Natural History Museum of Los Angeles County]. and the Society of Motion Picture Engineers. He later became associate editor of International Photographer, lectured at the University of Southern California, and became the West Coast representative for the Register Tribune Syndicate and a photographer for Look. The Herrick description of the photograph collection makes it clear why Theisen would have been interested in a film as novel as [Triptych Poem]. The series consists entirely of motion picture film-frame specimens. . . . [They] document a wide variety of formats in relation to image size, sound on film, and color processes. 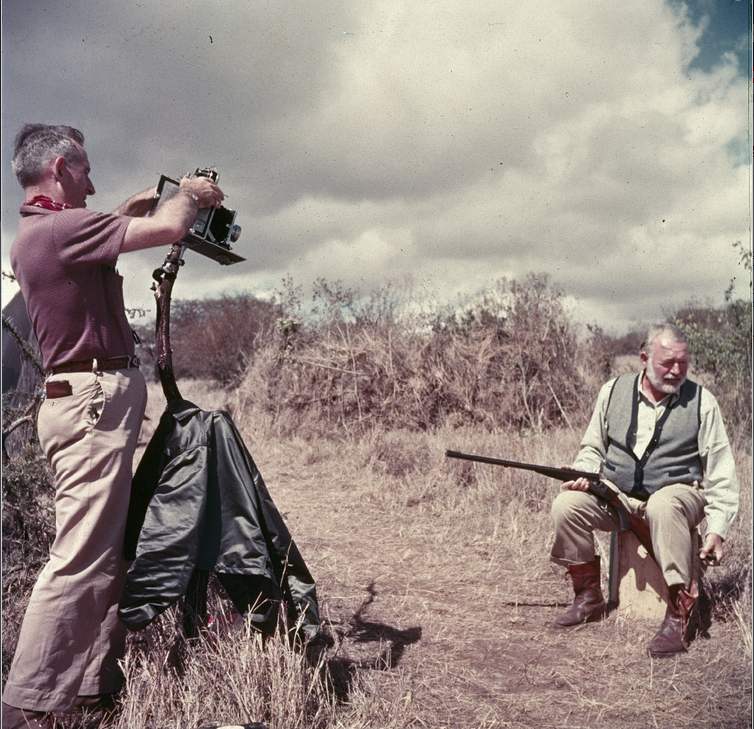 The specimens were collected by Theisen in the 1920s and 1930s, and they reflect his interest in film technology, cinematography, and film stocks. . . . Some 19 different film gauges ranging from 8mm to 85mm, more than a dozen sound recording processes, and more than 50 types of color processes can be found. Theisen's articles for the journal International Photographer (1933-37) are largely about the history of motion picture technologies. The publication was a house organ for the large union of technical workers, the International Alliance of Theatrical Stage Employees (IATSE) and Motion Picture Machine Operators (MPMO), which also represented film lab workers, cinematographers, and others. He also published articles in the Journal of the Society of Motion Picture Engineers, such as "The Depicting of Motion Prior to the Advent of the Screen" (Mar. 1933) and "The History of the Animated Cartoon" (Sept. 1933). The Earl Theisen Collection on the History of Motion Pictures is housed at the Seaver Center for Western History Research, Natural History Museum of Los Angeles County. Its biography offers that he "served as Honorary Curator of Theatrical Arts at the museum for a few years following 1931. Theisen was a technician at the Dunning Process Plant, a member of the Society of Motion Picture Engineers, and a member of the Society's Historical Committee." As "William Earl Theisen" he appears in the Merritt Crawford Papers at the Museum of Modern Art. He corresponded with Crawford (an eccentric collector of early cinema ephemera), Georges Méliès, and the inventor Eugene Lauste. Independent film historian Buckey Grimm has been compiling documents and information about Theisen for several years and shared much of it for this posting. Charles Tepperman (University of Calgary) introduced the only film on the program that actually received an ACL award. He also wrote the following text for the forthcoming Web release of that movie. Unknown in the annals of film history, Leslie Thatcher was a star of the amateur cinema world. In the mid-1930s Thatcher was a winner of numerous international awards, whose well-crafted short films evince a striking aesthetic sophistication. During the 1930s the category of “amateur film” encompassed a wide variety of styles including documentary, experimental and industrial works. The porousness of the amateur film category allowed for a dynamic and vernacular mode of film expression that drew on examples and styles from elsewhere and infused them with localized significance. Thatcher’s amateur films reflect this in their blending of globally circulating art cinema stylistics with their rootedness in local milieu and regional customs. In the 1930s Thatcher was an American Cinematographer prize-winner and three-time winner of Amateur Cinema League annual “Ten Best” honors. Closer to home, Thatcher was instrumental in founding the Toronto Amateur Movie Club in 1934. About Leslie Thatcher himself, little information is available, except that he worked as a salesman for paper and engraving companies during the 1920s and 30s. His earliest extant film, Mighty Niagara (1933), is a 14-minute silent work that narrates a steamship voyage from Toronto to the Niagara Falls. It won a Silver Medal for Travel in the 1933 American Cinematographer amateur movie competition. Another Day is a city symphony film of Thatcher’s hometown, Toronto. City symphonies were an early type of non-narrative film that emerged in the 1920s and presented cities like New York or Berlin in montage form, using editing to draw out some of the energy, routines, and rituals of daily life in a big city. Like other city symphony films, Thatcher’s follows the chronology of a day’s activity, fragments continuous action, and emphasizes quotidian objects (the alarm clock, the toaster, the coffee pot) to present a modernist visual record of Toronto. The film was named one of the Ten Best amateur films of 1934 by Movie Makers magazine, and the award citation describes it as “a splendid example of the relatively simple avant garde film, so popular among European amateurs but so seldom attempted by even the advanced workers of the American continent.” Thatcher made other award-winning amateur films in the 1930s, but by the end of the decade he had moved towards the production of industrial and sponsored films, establishing his own company, Thatcher Film Productions, around 1939. -- Excerpted and adapted from Tepperman's essay “Uncovering Canada’s Amateur Film Tradition: Leslie Thatcher’s Films and Contexts” in Cinephemera: Archives, Ephemeral Cinema, and New Screen Histories in Canada, Gerda Cammaer and Zoë Druick, eds. (Montreal: McGill-Queen’s University Press, forthcoming). Charles Tepperman is an assistant professor of film studies in the Department of Communication and Culture at the University of Calgary. He received his PhD from the University of Chicago in 2007. 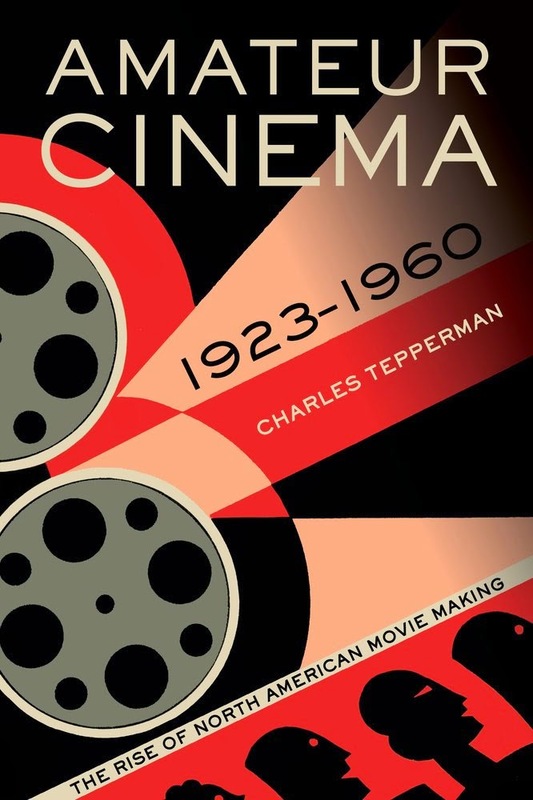 His book Amateur Cinema: The Rise of North American Moviemaking, 1923-1960 (University of California Press) will be released in December. Rick Prelinger's blurb tell us that the book not only “vivifies the untold history of amateur cinema, but mobilizes the history and aesthetics of amateur cinema as a wedge to consider complex aspects of cinema as a whole,” including “the nature and incubation of technical innovation, and the practices of personal media-making, mashups and remix." Jonah Volk made an unscheduled announcement. In the course of his work as a media preservation specialist at the New York Public Library, last week he found the NYPL Theatre on Film and Tape Archive has a print of Follow the Girls, which the 1944 Ten Best list in Movie Makers described as 650 feet, 16mm, Kodachrome, with music on disc, "by Oscar H. Horovitz, ACL, of Newton, Mass." Follow the Girls records scenes from the Broadway musical of the same name. The NYPL catalog lists "1 videocassette (U-matic, NTSC) (23 min.) : sd., col. ; 3/4 in." Excerpts of "dances and musical numbers are prefaced by general remarks about the genre. Note however that the soundtrack does not necessarily play the actual accompaniment to the excerpts." The catalog lists the show's numbers seen in the Horowtiz films as "Strip flips hip," "Thanks for a lousy evening," "You're perf," "Out for no good," "You don't dance," "Follow the girls," "John Paul Jones," and "I wanna get married." Although it was a hit on Broadway, running from April 1944 through May 1946, the show and its songs are not well remembered. The Horovitz film, however, carries a somewhat rare distinction, as its ACL leader and Ten Best logo are in full color. The video access copy is available for study at the Library for the Performing Arts at Lincoln Center. The film print is in off-site storage, awaiting preservation. The Volk announcement of the Horovitz film led me to see if there was more information than could be gleaned in Movie Makers (which we can now keyword search and download via the powerful Lantern search platform). Happily, in 2012 someone set up a website specifically devoted to the memory of Oscar H. Horovitz (1899-1989). "He was an amateur film maker and received more than 100 awards in competition," according to OHHmovie.com. He also kept scrapbooks about his film work, filling 20 boxes. 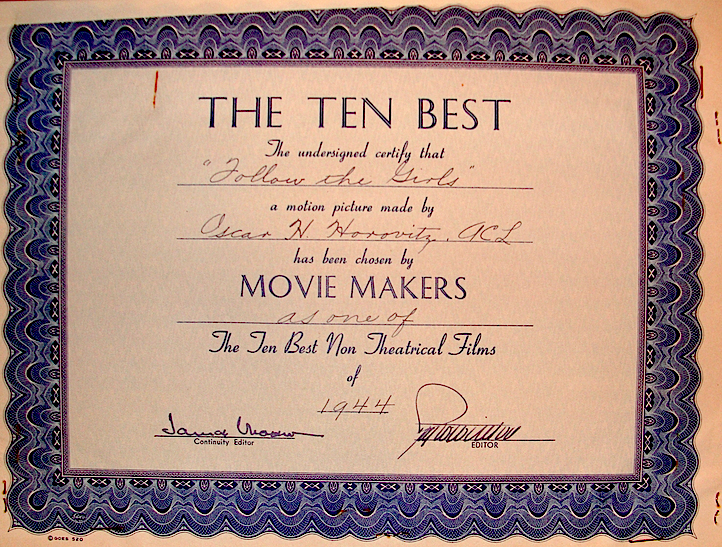 Among the items digitized is his Ten Best certificate for Follow the Girls! From 1935 to 1944, Movie Makers altered the name from Ten Best Amateur Films to Ten Best Non Theatrical Films. In 1948, the publication returned to the original name. Able to retire in 1949, Horovitz obviously set about his amateur film production in earnest. He won four additional Ten Best recognitions, for Ringling Brothers and Barnum and Bailey Circus (1950), Venezia: Pearl of the Adriatic (1951), Colonial Williamsburg (1954), and Belo Horizonte (1956). The website also includes an Honorable Mention certificate for Guatemala (1948). Time to track those down. And a postscript to the Horovitz story: OHHmovie.com modestly notes "He made many public service films." When I posted a draft of this blog post to the Orphan Film Symposium Facebook group, Rodney Stewart Hillel Tryster reported the Spielberg Jewish Film Archive at Hebrew University of Jerusalem holds films by Horvitz: The Israeli Story (195?) and They Call It Technion (1959? ), plus two on the archive's YouTube channel, both advocacy films for Hadassah. Passport to Life (1954) "Photography and original story by Oscar H. Horovitz," narrated by Martin Bookspan. 32 min. Added title: Operation Ali Baba. Watch here. There Is Hope for Thy Children (195?) The only screen credit reads "Photographed by" OHH. 13 min. Watch here. Kimberly Tarr is Media Preservation Unit Head in the Barbara Goldsmith Preservation and Conservation Department, NYU Libraries, and a 2009 graduate of the NYU Moving Image Archiving and Preservation Program. Her MIAP thesis, "The World She Watched: An Examination of the Adelaide Pearson Travel Films," dealt with a 1930s amateur film collection at Northeast Historic Film that she also helped preserve. She presented that work at the 7th Orphan Film Symposium in 2010 (audio of which can be heard here) and subsequently published "Round the World and Back Again: Mapping the Cultural and Historic Significance of the Adelaide Pearson Film Collection," The Moving Image (Fall 2012). Robbins Barstow's The Abbakadabba Coopno (1941) is one of four 16mm films Barstow donated to NYU, where he received an M.A. in education and history. The Barstow Movie Collection came to the University Archives in 2008 and also includes Everyone’s Coming to the Guild! (1943, which will be part of our online project), Hudson Guild Farm (1943), and Youth and the Future (1944), a lesson on FDR's Four Freedoms. Barstow made all of these short, silent amateur productions in collaboration with the Hudson Guild Neighborhood House, a community center in Chelsea-Hell's Kitchen, where he and his wife Meg (Margaret Vanderbeek) worked after they were married in 1942. The Abbakadabba Coopno's subtitle, "The Newark Kid-Stars in Their Real-Life Drama of Christian Farm Work,” reveals its plainspoken theme. The Port Murray, New Jersey farm for city youth was run by a collective of pacificists, many of whom had registered as conscientious objectors before Pearl Harbor. (Barstow was a pacifist but had already been classified as 4-F, medically ineligible for military service.) Abbakadabba's inter-racial cast, showing young men and boys working and playing side by side, was remarkable for its time. Three frames from Barstow's film. 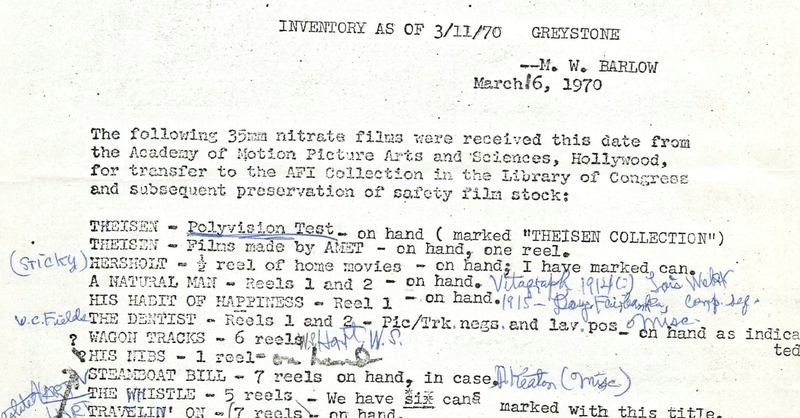 Barstow Movie Collection, University Archives, NYU. We discussed how best to present the film: in silence? with live musical accompaniment? with a recording of Barstow's voice? In the end we embraced the true amateur aesthetic and trusted it to play with the sound track the filmmaker added 65 years after the fact. The clean 2006 recording by Texas fingerstyle guitarist Bruce Ramsey creates some distance from the 1941 film, but such was Robbins Barstow's choice when he screened it a Northeast Historic Film's 2006 Summer Symposium "The Working Life." In other research related to this amateur film project, Kim Tarr located 16mm films by Ephraim Horowitz (1916-2012), who won a pair of Ten Best prizes, for EPH 4/27/16, a comic autobiographical piece from 1979, and My New York Experience (1980). Throughout his long life he was active in several New York amateur film clubs as well as the Society of Amateur Cinematographers. Tarr and Dan Erdman have compiled further research about Horowitz, though that will have to wait for a future appearance. Maria Vinogradova is a doctoral candidate in cinema studies at New York University. Researching the history of amateur filmmaking in the Soviet Union has required her to find material outside of archives. In general, the official state archives choose not to collect amateur works. Those films that survive are often kept by individuals who prevented them from being discarded by the institutions -- factories, schools, "houses of culture," and others -- that originally facilitated their production. 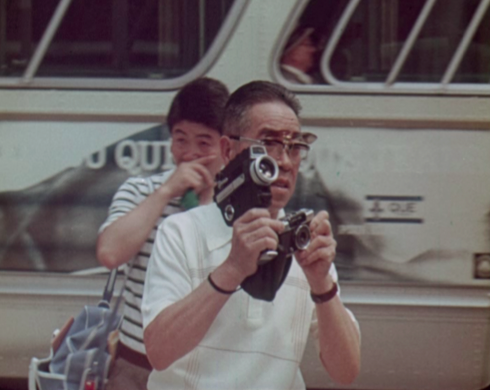 Russian 35mm filmmaker records Japanese Super 8 maker in Montreal. Maria Vinogradova's notes on this Soviet amateur production can be found here: "Pictures of the West More Colorful than Red." In her introductory remarks at MoMA, Vinogradova reported that the director of the film has not yet seen the digitized copy of his own film, but that he runs a movie house in Moscow and looks forward to presenting it there. 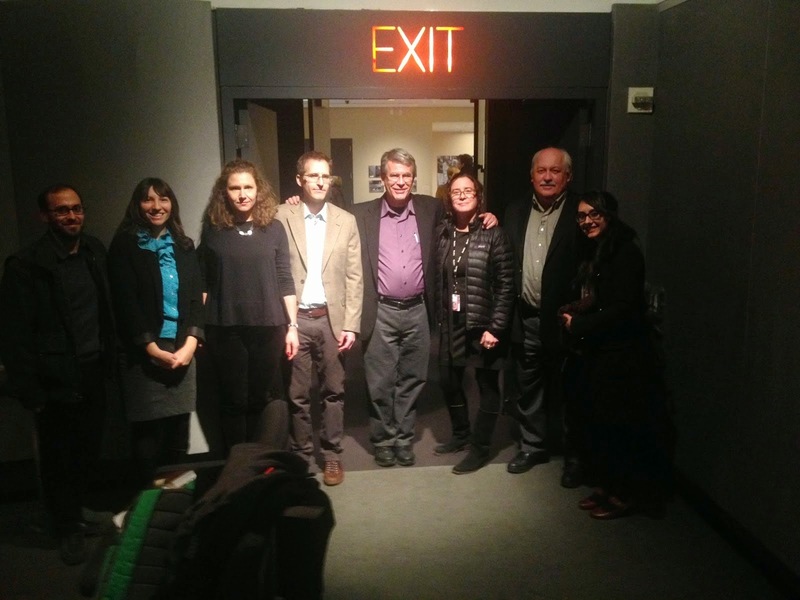 As so often happens at these Orphan Film Symposium events, there was a serendipitous discovery among researchers. Just before showtime, Vinogradova learned from Tepperman that he knew where to find one of the Soviet amateur films she had long been seeking. Turns out that curator and scholar of amateur film Melinda Stone gave him a box of films that included a Russian title. After finishing his dissertation, he passed the box along to Chicago Film Archives. Now CFA has put the movie online. Gift to Mother (ca. 1966) was distributed in the United States by the Society of Amateur Cinematographers, which launched in 1936. Distinct from the ACL, the SAC was a creature of American Cinematographer, the journal of the American Society of Cinematographers, a Hollywood guild. Clearly there is more research, discovery, preservation, and screening to be done if the worldwide phenomenon of amateur cinema is to be understood. exiting MoMA's Titus 2 Theater, November 18, 2014.
entering MoMA's Titus 2 Theater, pre-show tech run, November 18, 2014.